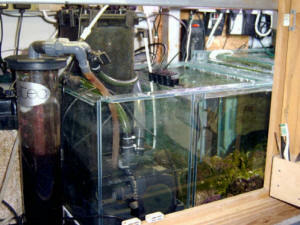 The thought process behind incorporating an ATS into your reef aquarium is two-fold. 1) To provide a unique habitat for micro-crustaceans, worms and the like (Raabe 2008) to live. These critters process waste, thus cleaning the water of dissolved organic compounds, and also produce plankton while reproducing in the water stream, thus providing the system as a whole with live food. 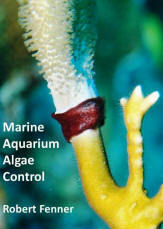 Turf algae grows well in the areas of the reef tank where there is high oxygen/ gas exchange. 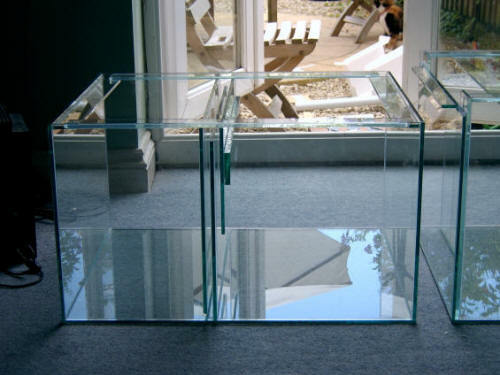 The system described here is a simple Perspex or glass screen over which water is allowed to flow within a portion of the sump. This provides a perfect environment for the turf algae to grow. 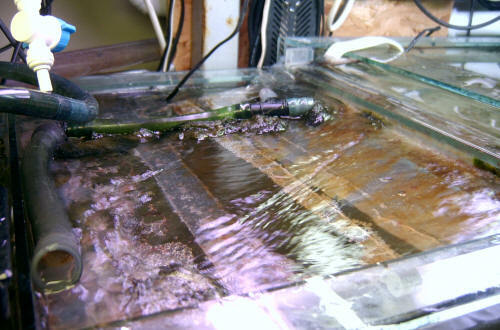 When designing my sump I had in mind that I would be incorporating an ATS from the start, but this can also be achieved within an existing sump arrangement by diverting some of the overflow over a screen or plate before entering the sump. 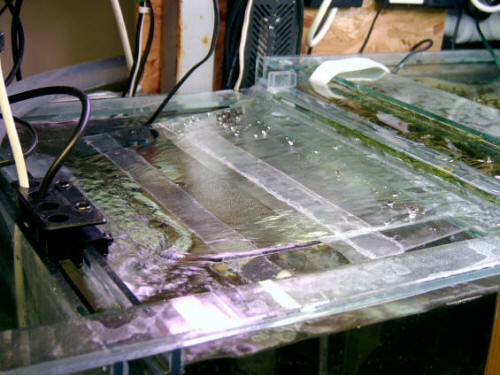 Another way to provide a good habitat is to lower the water level in the last compartment of a sump so that the water flows down a vertical glass pane. I had the sump designed as two sections, primarily because it was to replace an existing arrangement and this was the only way that I could get a large sump into my cabinet. Seen below, the first section of the sump has one end lower than the rest. The water overflows from this end, over the glass pane (ATS) and into the second section. The picture below shows the second section, with the overflow part of the first section shown on the right. As you can see, fixed to the first baffle in the middle is a thick piece of glass. The ATS pane is designed to be removable, it rests on the top brace to the right, and this thick piece of glass to the left. Water is designed to flow over it and into the compartment underneath. This picture shows the same section after installation underneath my tank. I have not yet put the screen in place, the water is simply flowing from the right hand section into the left in this picture. This is the Perspex sheet intended as the screen. The bars across were for strengthening. 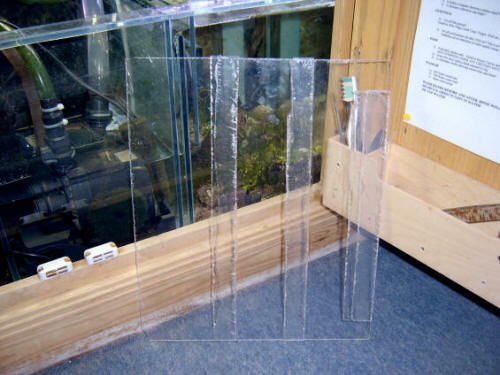 I have since replaced the Perspex sheet for a glass pane, as I found that even with the bars, once a good growth of algae was on it the Perspex started to bow. The sheet is placed on the right hand brace and the supporting bar on the baffle to the left. Water flows over the sheet and into the section underneath. Some turf algae from my reef tank is placed on the screen and temporarily held in place by some flexible tubing to ‘seed’ the ATS. It takes a week or so for the turf algae to get a decent hold and the tubing is removed. As you can see, diatoms are starting to build up on the ATS after only a couple of days. This is two months later, just before I cropped the ATS for the second time. As you can see, the turf algae has nearly completely covered the screen. Lighting over the ATS is two 15w normal output marine white fluorescent tubes. There are two Compact fluorescent marine white bulbs (36W) lighting the other side of the section over the Chaetomorpha. Some of the light from these would also be utilised by the turf algae. It would be interesting to analyse the algae and the detritus held within with a microscope to see what life there is living there. Since I do not have such equipment yet I have made do with a magnifying glass. So far I have identified copepods, amphipods, isopods and various worms, mostly of the ‘bristle’ variety. I am glad that I married my wife before she caught me looking at algae through a magnifying glass, her face when I was ‘caught in the act’ spoke volumes! Other changes were made (installation of RDSB, addition of live rock section and increased water volume) to my sump/ refugium arrangements at the same time as the incorporation of the ATS. Because of this I am unable to say how much difference just the incorporation of the ATS has made. Since making these changes to my reef tank, however, the system as a whole has benefited with increased growth of Scleractinian corals and general excellent health of inhabitants including fishes. Nitrates in the system have been reduced from about 5ppm average to just a readable trace since the efficiency changes. Phosphates are easier to control and keep at the lower end of the scale (0.001 – 0.003ppm). Chaetomorpha was already being grown, so the combination of increased water volume, RDSB (Remote Deep Sand Bed) and ATS must be responsible for this. The aim was never to reduce these parameters to zero as both are necessary nutrients. They do, however, occasionally show up zero - if this happens then the feeding is increased. I am now able to feed the system more frequently, and have added an automatic feeder to provide dried food throughout the day. 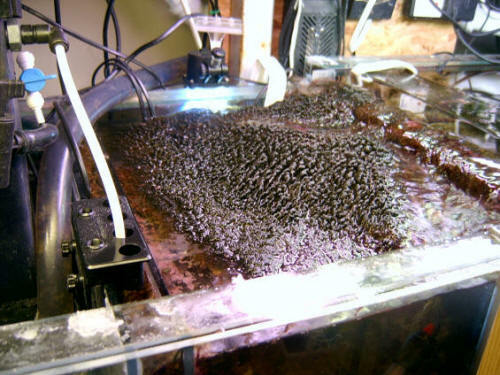 When the turf algae is cropped or disturbed – sending the cloud of brown detritus collected by the algae (with whatever else is in there) into the water stream - coral polyp extension is seen to be exaggerated on certain corals (Hydnophora, Goniopora, Merulina and Galaxia particularly). This evidence is purely anecdotal. It would be interesting to see if another system/s benefit with just the addition of the ATS and no other changes. 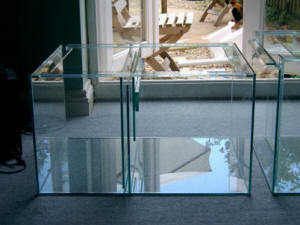 As we all know, space is at a premium in most reef tanks, and inside the cabinet itself is no exception. The ATS makes a fine addition to a fishless refugium design, while taking up very little of the valuable real estate underneath the tank.